If you are questioning whether SMSF is for you or not, definitely stick around and make notes while reading this blog post. We will be talking about the SMSFs’ not-always-so-obvious benefits, revealing some incredible statistics, warning you of potential risks and complications. SMSFs are the largest wealth accumulation tools which are already making happy over half a million of Australians. Make sure you gain as much understanding of SMSFs as you can before making your final decision. We provide a complete range of services from your tax return to your business plan, from mergers and acquisitions to superannuation. The difference is our desire to understand the ‘world view’ of each client and to partner with them into the future. Where do you want to be in two, five or ten years’ time? This is exactly why we are always looking for more expertise, experiences and opportunities to inject in our work. Julie Dolan is incredibly good at solving many strategic and taxation related issues. We are well-known for helping you improve your business structure, set SMSF, understand cloud accounting and simply learn more about your own business’ strengths and weaknesses. The conjunction of Julie and ATB Chartered Accountants is inevitable and mind blowing. Julie kindly agreed to sit down with ATB Chartered Accountants and chat about how we all can make a difference and improve our clients’ lives. It was inevitable to decide on running a small event together. Julie and ATB Chartered Accountants are passionate about SMSFs due to the opportunities the funds enable. On the 17th of April a small group of people sat around a large round table together with Paul Rattray, Michael Mekhitarian, Jim Vass and Julie Dolan to discuss what the Australian superannuation future holds. Julie has over 20years experience in the Accounting and Financial Services Industry. Over this period she has held roles in accounting, investment advisory, practice management, strategic/technical support and advisory to accountants & financial planners, developing complex strategies for high net worth clients. 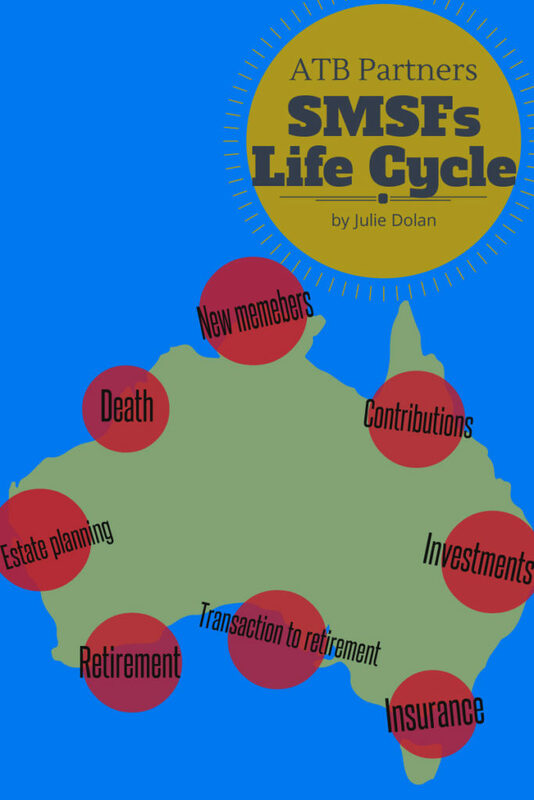 Julie shared some shocking facts & statistics, explaining the SMSF life cycle, presenting 5 top strategies also leaving some room for interaction. Everyone in the room took an advantage of talking to Julie about their own situation and intentions. We could not be happier! HERE COMES THE MIGHTY SMSFs: the SMSFs benefits and risks. SMSF’s are now the largest and fastest growing segment of the superannuation industry. It makes up one third of all money invested in superannuation. Don’t believe the statement? See the number! There were registered 23,792 net establishments by June 2009 which jumped to 26,243 by June 2012, sky rocking to the current 33,555. The total number of SMSFs in 2009 was just under 400,000; however today there are 508,330 SMSFs. Moreover, this number shows no signs of decreasing. The amount of wealth owned by SMSF’s is over $500 billion as for today. There are several main reasons why self-managed super funds are so incredibly. Let’s have a look at some of them. 1. SMSFs enable your control over your investments. Although it means certain level of responsibilities it also means wealth accumulation rather than dissipation. Some people want the hands-on control that comes with a self-managed super fund (SMSF). SMSFs members can instantly change their investments and/or the asset allocation of their portfolios. SMSFs also enable members to invest in a way that is generally not available in most large super funds. SMSFs with larger balances, for example above $200,000, may have lower fees than many large super funds which are really depending upon the circumstances. Of course, along with great advantages there are great responsibilities emplaced. SMSFs can be time-consuming, require some level of investment knowledge (unless you engage your financial advisor), there are penalties enforced for non-compliance, costs can be considered as high, there is certain level of hazard of dominant trustee (without well planned strategy) and even risk of losing interest because according to ATO statistics many people are holding onto their self-managed funds well past the funds’ used-by date. Thus, without a good strategy SMSFs can become a great risk. However, the benefits seem to be over-writing the risks. How risky do you estimate your financial freedom and wealth accumulation? Julie pointed out that SMSFs go through Life Cycle which consists of eight steps. Each of the steps is affected depending on your goals therefore it is important to plan each one, tailoring the strategy. Here are only some of the areas many people requested to help with. Depending on your goals and objectives, SMSF can assist in a wide range of investments because ATO as a regulator does not dictate what the trustees of an SMSF can and cannot invest in. Subject to SISA requirements and the ‘sole purpose’ test of course. Having control over your own money means making them work for you before you can access them. As a SMSF trustee, you can invest in direct property, artwork, and virtually any valuable asset. You can even purchase business property, such as an office, and use the property in your business. From a legislative viewpoint, there is no best practice to how you want to set your SMSF up. However, if we look at recent data from the Australian Taxation Office, approximately 91 per cent of SMSFs set up in 2012 used individual trustees. Individual or company trusty is fine; however there are certain complications and limitation for each of them. Superannuation Trustee Company is set up to act as a trustee of a regulated superannuation fund within the meaning of s19 of the Superannuation Industry (Supervision) Act 1993. The company’s constitution must have a clause prohibiting the company from distributing income or property to its members. Some people are hesitant when deciding between company and individual trustee. Although individual trustee can sometimes be cheaper, company trustee can be more secure when it comes to the loss (death, separation or divorce) of one of the trustees (if more than one are appointed). *Talk to us if you are not sure which one to go with. Retirement planning is one of the greatest interests people express when they start discussing SMSFs. Australians are about to face a raised retirement age, pushing the access to their savings further away from them. Mr Hockey recently flagged a possible change to the way the aged pension is indexed in Australia. Currently it’s linked to average male weekly earnings. “I’m not going to speculate on the budget but I will note that over here (in the USA) over the last 40 years 60 per cent of male workers have had a real cut in their incomes. In Australia we haven’t had that. Male weekly total earnings have been at a higher rate but it is not always going to be the higher rate. With such unstable future of our retirees every Australian is now especially concerned about where their money is. Julie also talked about reversionary pension, segregation of assets and estate planning giving some crucial information away. For example, did you know that if you withdraw super benefits on or after the age of 60 your super payment will be free of tax? 20 August 2011 was the twentieth birthday of superannuation guarantee. This is a significant anniversary for the nation, and worthy of reflection. Australia is faced with the financial and social challenges of an ageing population. Superannuation Guarantee has enabled Australia to develop a strong and substantial superannuation system to help address these future challenges.